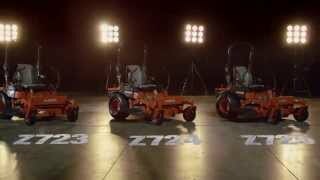 Kubota Z700 Series - Model Landing - Camrose Dynamic Sales & Service Inc. This series was designed with the professional landscaper's long workday in mind. The Z700 delivers superior grass-cutting performance, while maintaining a stable and comfortable ride. The Z700 Series mowers are available with mower decks that offer the superior grass-cutting performance demanded by professionals. A 6-inch deep deck and anti-scalp rollers ensure a fast and clean cut day in and day out. The ergonomically positioned instrument panel gives you easy access to controls, the hour meter and other indicators. The Z700 Series brings luxury to every job. The operator's seat offers a thick cushion, 19.6 in. high seatback, adjustable armrests, and slide adjustment, giving you the ideal seating position to make your work easier. The Z700 Series dual operation levers provide smooth and precise control. The damper strength can be adjusted according to your preference. The Z700 Series is equipped with dual Parker ® * transmissions . Designed for easy maintenance, each transmission has an integrated pump and motor for increased efficiency and simplifi ed service. Also, each transmission has a separate oil supply for increased durability. And parts such as the drive link and brake rods are positioned for easy maintenance. The Z700 series mowers have 48", 54" and 60" deck width options in both a Kawasaki and Kohler model. The mower deck's belt drive is conveniently located for easy access simplifying belt replacement and inspection.